Zendesk Talk automatically creates a ticket in Support for many types of call. Use this article to understand how these calls become tickets. You cannot disable the creation of tickets. 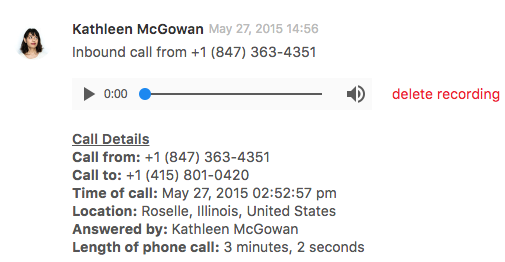 Details about the call or voicemail, and the call recording are added to the ticket as a comment, similar to the example shown below. If you place an outgoing call from an existing ticket, the comment is added to the existing ticket. You might see different results for the length time shown next to your recording and the Length of phone call time under Call Details. The time shown next to the recording includes only actual talk time. The Length of phone call time includes talk time and events that were not recorded, like hold time, transfer time, and time spent in queue. You can configure Zendesk Talk to prevent users from accessing the live call recordings (see Enabling Zendesk Talk and configuring general settings). If your administrator has allowed the recordings to be accessible, the user can click a link to the recording from the notification email to hear it. You can delete recordings from tickets, by clicking the delete recording link (see Deleting recordings from tickets). You can add a comment to the ticket and update the ticket properties while you speak with the customer. Zendesk Talk identifies users by their phone numbers. If the caller is an end-user with an existing profile, and calling from a number already added to the profile, their existing profile is set as the ticket requester. If the number has not yet been added to a profile, a new profile is created using the calling number as the user name. Direct lines are used to identify a user. When you add a unique number to a user's profile, it's automatically set as a direct line. If the caller is an existing end-user calling from their direct line, the user's existing profile is set as the ticket requester. Users can have more than one direct line. Shared numbers are linked to multiple user profiles. A shared number always starts out as a direct line for one user, but when the same number is added for another user, it's added as a shared number. An incoming call from a shared number will be associated with the user that has that number as a direct line. When receiving a call, Talk checks to see if a user is associated with the number that is calling. If no user has the number as a direct line (for example, if it’s been deleted from the user), then a new user will be created that has that number as a direct line. The number will no longer be associated to the users that has that same number as a shared number. A user can have only one shared number on their user profile. Select a user and click edit. In the user's profile, click + add contact and select Phone. Enter a phone number for the user. If you have phone number validation enabled, this number must be in E.164 format. To add additional numbers, repeat steps 2-4. Calls received from new, unknown, users generate new end-users that are identified only by the telephone number they're calling from. Unknown users can also be existing users if they're using a telephone number that they haven't added to their user profile. In this case, you can merge the new user account with their existing user account. For more information, see Merging a user's duplicate account. When merging users, all phone numbers that the merging user has will be added to the receiving user. The only scenario where a number is discarded during merging is when two users both have a shared number. In this case, the shared number of the merging user will be discarded. Sometimes, callers might contact you about an issue for which a Zendesk Support ticket has already been created. To handle this situation, complete the call and add comments as needed to the new ticket. You can then merge the new ticket with the existing ticket. The phone number shown at the top of a ticket is the phone number that caused the ticket to be created. When merging two tickets that both have a voice comment, the number that caused the creation of the ticket being merged into will be shown. For details, see Merging tickets. Can numbers be added to an organization as a direct number so that a company's main outbound caller ID is associate with the organization instead of one of it's employees? Or are we going to have to create a user that is really the organization so that tickets don't automatically get assigned to the first person from that company that called in or has the company number set as a direct number? Did I read it correctly that users can only have one shared number? What about companies that have multiple outbound caller IDs? Can we add labels to each number (i.e. Home, Work, Cell)? I do not see any way to differentiate the numbers. The current setup makes SMS very difficult if you do not know which numbers can receive SMS messages. This feature is long awaited... Good to see it's finally here. Is it possible to import extra numbers via .csv or do we have to add them to 200+ users manually? Now: Labels, labels, labels... for phonenumbers! Do voicemails are obligatory created as new ticket with status "open" or is it possible to get them marked as "New"? Actually I would like that voicemails create tickets marked as new and visible in a view with all other tickets marked as new (via mail, Web form, Web widget) and not assigned to an agent. Currently all voicemails create tickets marked as open and are automatically assigned to the talk agent who is the our list of talk agent. I checked my triggers to see if there was one that makes it works like this but I didn't find. I prefer to ask if voicemails can have the status new before to go further in the trigger settings in vain. Thanks in advance for your hep. This is actually an interesting question...I'm not totally sure what the answer is. I'll see if I can find out for you! If you're still having trouble finding out why these voicemails are auto-assigning please feel free to reach out to us at support@zendesk.com and we can take a look. How can we import (via Bulk Import csv file) additional phone numbers? How would one distinguish landline phone # vs. cell phone number? Is it possible to create a new ticket by the Talk Partner Edition API, setting the requestor by the caller's number? I did some testing, but I can not do that, when I set shared_phone to false and try to create a ticket, I get an error message that the number is already being used by a user in my Zendesk. Anyone here have the same question? I want to know how can I configure talk to create a ticket for missed calls or calls when the agents are not availables. A "missed" call is a call that connects to an agent, but the agent doesn't accept or decline before the call returns to the queue. This status only applies to the agent leg of a call. An "abandoned" call is a call where the customer hangs up before being connected to an agent or voicemail. This is an overall call status; it does not apply to a call leg. With this understanding, both of your examples should be considered missed calls and should create tickets with the change in your settings. Is it possible for the IVR option chosen by the end user to populate within the call info within the ticket? At this time, you cannot pull that information into the ticket. Can I route Talk tickets based on the received at number using triggers and automations?